Ollie lives on a sparsely populated island. There is lots of space to play, but not many friends to play with. One day the sneaky wind steals Ollie’s hat, then it takes his scarf and his balloon too! Ollie wonders why the wind is being so naughty, but then decides that the wind must just want to play. He tries to play with the wind using all his favourite toys, but the wind isn’t interested. Being the problem solver that he is, Ollie keeps persisting until he figures out how to play with the wind. 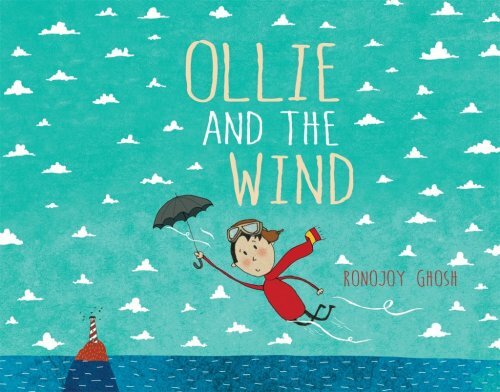 Ollie and the Wind is a sweet story that personifies the wind. Children will enjoy identifying the obstacles to Ollie’s actions (e.g. why can’t he catch the wind with a net or with a can? Why can’t the wind play chess? etc). This also allows children to work on using the conjunction ‘but’ in their sentences (e.g. He tried…. but….). The pronouns ‘he’ and ‘his’ are repeated many times throughout the book, making it a great choice if your little one is working on this goal. The illustrations are delightful and will encourage children to make inferences about the story. I particularly enjoy the final pages of the book showing a wordless scene of the wind ‘returning’ Ollie’s hat and scarf.